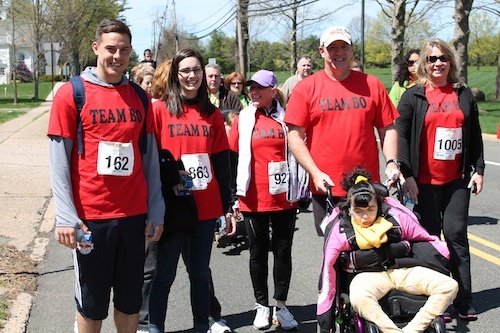 Mike and Bo Geraghty, second from right, with other members of “Team Bo” at the 2013 Miles for Matheny, an annual fundraiser and community event. A recent decision by a Superior Court judge in Somerset County, NJ, has upheld a 2011 decision by the Peapack-Gladstone, NJ, Land Use Board to reject a proposed expansion and renovation by Matheny. That rejection was based primarily on complaints by neighbors that increased traffic caused by the expansion would make Highland Avenue, the road leading up to Matheny, more unsafe and would imperil the lives of those using it. This entry was posted in Uncategorized and tagged Bo Geraghty, Geraghty, Highland Avenue. Bookmark the permalink.